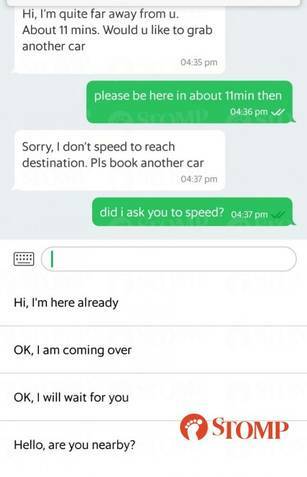 When Stomper Mr Li booked a Grab ride, the driver said he would reach in 11 minutes, however, when Mr Li agreed the driver said he would not speed to get there. Mr Li booked the Grab on Oct 11 at about 4.30pm, to travel from Jurong East Street 61 to Bukit Batok Street 11. He sent screenshots of a conversation with the driver on the Grab app to Stomp. 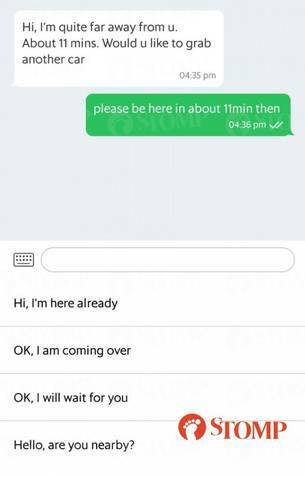 After the driver accepted the booking, he received a message from him at 4.35pm which said: "Hi I'm quite far away from you. About 11 minutes away. Would you like to grab another car?" Mr Li replied a minute later at 4.36pm and said: "Please be here in about 11 minutes then." At 4.37pm, the driver then said: "Sorry, I don't speed to reach a destination. Please book another car." Mr Li replied with: "Did I ask you to speed?" The driver said: "You demanded to be in 11 minutes." "Look at the chat history, you said 11 minutes. 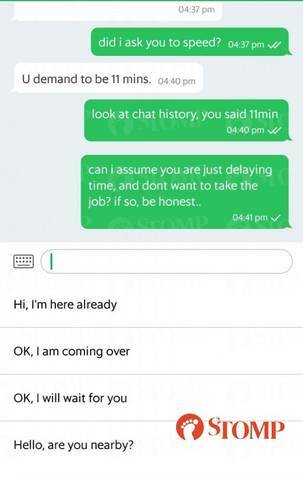 Can I assume you are just delaying time, and don't want to take the job? If so please be honest," Mr Li replied at 4.41pm. Mr Li told Stomp: "I think he was just another driver who was trying to get a better-assigned job and who wants the customer to cancel the ride instead." In the end, the driver cancelled the ride.